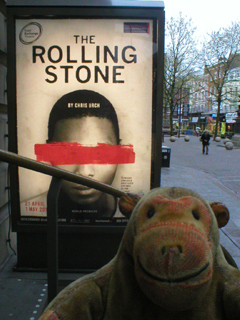 Mr Monkey arrived in Manchester by bus and scampered along to the Royal Exchange Theatre for the press night of The Rolling Stone at the Royal Exchange. This production is the world premiere of a Bruntwood Prize-winning play by Chris Urch, inspired by actual events in Uganda. Homosexuality is severely punished in Uganda by the authorities; failing to report a 'known gay' gets up to four years in jail. Local mobs are more severe, and a trashy magazine, The Rolling Stone, has taken to raising its circulation by publishing photos of men and women it claims are gay. 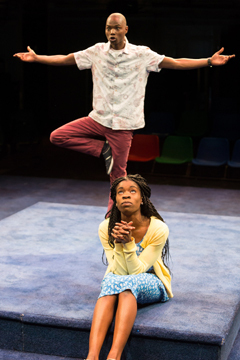 The action of the play centres on a family who have recently lost their father. The elder brother, Joe, has just become the pastor of his father's church and has found out that they have no money. The younger twins, Dembe and Wummie, are about to take their exams to get into medical school. 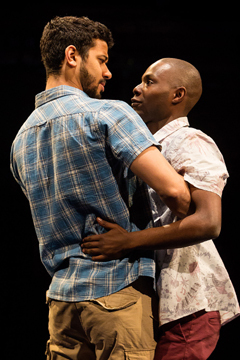 Dembe has just started a relationship with a male doctor from Ireland, which makes it very unfortunate that Joe has been persuaded that the best way to increase the congregation and bank balance of the church is to preach incessantly and virulently against the menace of homosexuality. In a toxic environment where guilt by association is taken for granted, where everyone knows there's no smoke without fire, and where someone close to the family has a self-serving agenda which they've convinced themselves is "God's work", the scene is set for tragedy. The stage is an empty blue space, with a raised plinth in the centre. This space becomes a lake, a boat, a church, a courtyard, or a house as required. There are some beautiful harmonies in the hymn-singing interludes. The wonderful cast are assured in their performances. Sule Rimi (Joe) is horribly convincing during his anti-homosexual rants, which sound so totally exaggerated that they probably came from a real sermon. Fiston Barek and Faith Omole are excellent and natural as the twins. Donna Berlin is interesting as Mama (though Mr Monkey would have been happier if it had been clearer whose mother she was) and Ony Uhiara is eerily silent as her mysteriously traumatised daughter, Naome. Gilbert, Berlin, and Uhiara are also appearing in Anna Karenina. Mr Monkey had trepidations about this play, worrying it might be a little too worthy and preachy; he's glad to admit he was totally wrong - this is a funny, hard-hitting, and gut-wrenching family drama with just happens to about an important subject (and all the preaching is strictly in context). Mr Monkey recommends it to everyone, subject to the Exchange's age guidelines. The Rolling Stone runs until 1st May 2015 in rep with Anna Karenina.